Can I Compost Cabbage? | Can I Compost This? 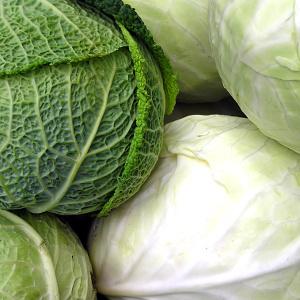 Yes, you can compost cabbage. Even though they’re pretty tough compared to flimsy things like spinach, cabbage leaves still rot down quickly in a compost heap – though it’s best to break up or chop up full heads to speed up the composting process of the compact bit. In composting terms, cabbages are a “green” (even the red ones) so they’re are a good source of nitrogen for your compost heap. If you’ve got a lot to get rid of, add them alongside “browns” (like newspaper, egg boxes or straw) to keep you compost balanced. Cooked cabbage can be composted as long as it hasn’t come into contact with anything on the “don’t compost” list – like oils or meat. Sauerkraut and other fermented cabbage can be composted but the vinegar in pickled cabbage can caused problems for a compost heap though, so leave that out.